How Much Are Closing Costs When You Buy a Home? A very common question that I get from first time home buyers is “What are closing costs and how much is that”? This post can be super lengthly so I will try and keep it as simple as possible. When you buy a home closing costs are inevitable these costs can range from title insurance fees to government recording fees. Please be aware that when you are buying a home for the first time – These costs are separate from your down payment amount. Your loan officer will be giving you a “Good Faith Estimate” (“GFE”). If they don’t give it to you, ask for it. Then, the day before the closing, ask your lender for the actual “Settlement Statement” (aka “the HUD” or “the HUD-1”), which is the final and complete form with all the numbers for the sale, including the actual closing costs. Purchase price $100,000 x 6% = $6,000 this will vary but the 6% is at the very high end so YOU can have an estimated amount of how much to set aside. Please also keep in mind that you have the option of negotiating these costs with the seller when you are buying a home so this money is less out of your pocket. Attorney (Lawyer) Fees, paid by either or both parties, for the preparation and recording of official documents.Title Service Cost(s), paid by either party according to the contract but by default seller may pay the majority, for title search, title insurance, and possibly other title services. 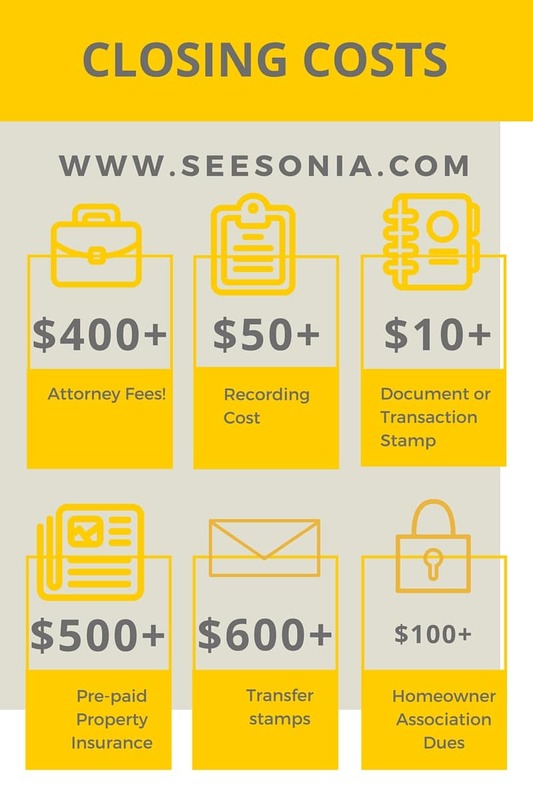 Recording Cost, paid by either party, charged by a governmental entity for entering an official record of the change of ownership of the property. Required by the government for recording the deed. Document or Taxes, paid by either or both parties depending on location (area of jurisdiction), charged by a governmental entity as an excise tax upon the transaction. Required by law. Survey Fee for a survey of the lot or land and all structures on it, paid by either party, to confirm lot size and dimensions and check for encroachments. Mortgage Application Fees, paid by the buyer to the lender, to cover the costs of processing their loan application. Appraisal Fees, usually paid by the buyer (although occasionally by the seller through negotiation), charged by a licensed professional Appraiser. Many lenders will require that an appraisal be performed as a condition of the mortgage loan. Home Warranties, paid by either the buyer or the seller. Warranties are available on resale homes insuring major household systems against repair or replacement for the buyer’s initial year of ownership. Pre-paid Property Insurance, paid by the buyer but may be reimbursed by the seller. Lenders will typically require that a mortgaged property be insured if the Down payment is less than 20 percent, and will usually require that the first full year’s property insurance premium be paid in advance by the buyer. Pro-rata property taxes, paid by the seller, the buyer, or both. Most (but not all) jurisdictions assess taxes on real property, which are usually payable at a specified date annually. If you are in Cook County taxes are paid 1 year in arrears. Transfer stamps, recording fees, and taxes – There are municipality fees that require transfer of any kind of tax that is levied on the transfer of official documents or other property. Transfer tax is paid by the seller of the property.